A Los Angeles Unified middle school and three elementary schools are gearing up to compete in the VEX Robotics World championships, where they will challenge their high-tech peers from more than 30 countries around the globe. More than 400 elementary school teams from around the world will compete in the VEX IQ Challenge, which runs April 28-30. 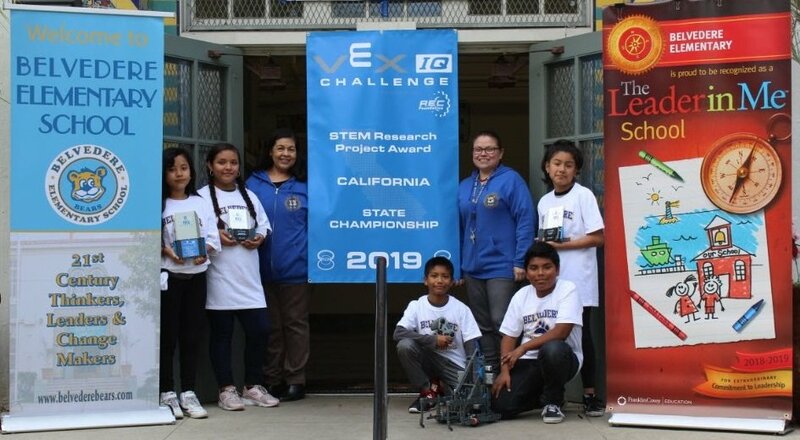 They include the Bots from Belvedere Elementary School in East Los Angeles; the Panthers from Pomelo Community Charter in West Hills; and Teams A and B from Vintage Elementary Math/Science/Technology Magnet in North Hill. In VEX IQ, robotics teams work collaboratively to pick up and stack colorful hubs on a 4-by-8-foot field. They also compete individually in programming and driving skills. Belvedere Elementary teacher Aurora Lomeli coaches Bots team members Emily Huerta, Misael Huerta, Cynthia Ibanez, Nayeli Ortega and Alex Valdez-Valdez. The team won the STEM Research Project Award at the state competition.